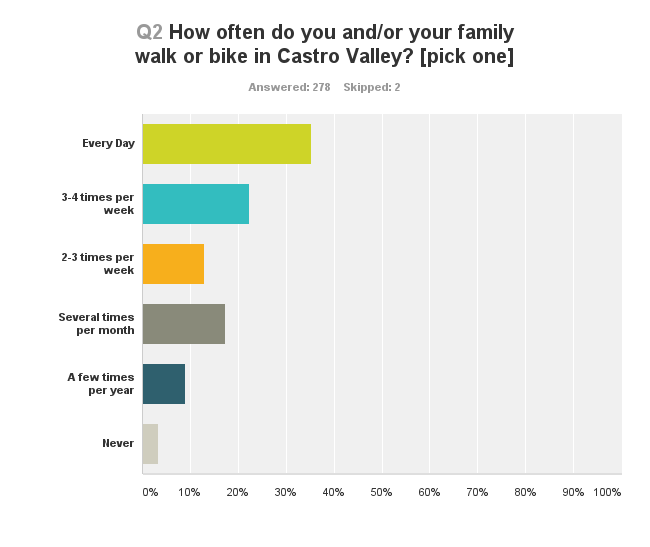 We at BikeWalkCV wanted to learn more about the specific issues, problems, and roads that were concerning Castro Valley residents, so we reached out to residents (in person, online, and through school email lists) and invited them to take our survey. We received 280 responses from January 2015 through March 2015. Many people in Castro Valley enjoy walking or riding a bicycle, but are limited by the lack of infrastructure — read on for the full results! Question 1: What is your connection with Castro Valley? 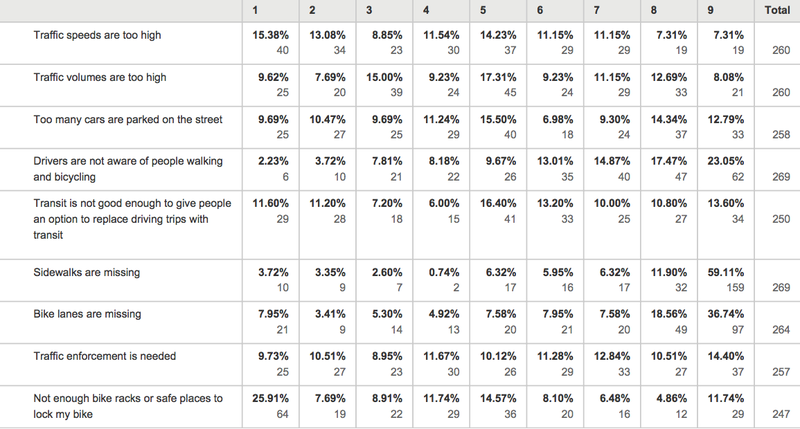 Question 4: Please rank, in order of importance, the biggest challenges in Castro Valley to people walking and bicycling more, with 1 being the least of our challenges and 9 being our most imposing challenge. Question 5: What are your top three streets for improving walking in Castro Valley? Question 6: What are your top three streets for improving bicycling in Castro Valley? 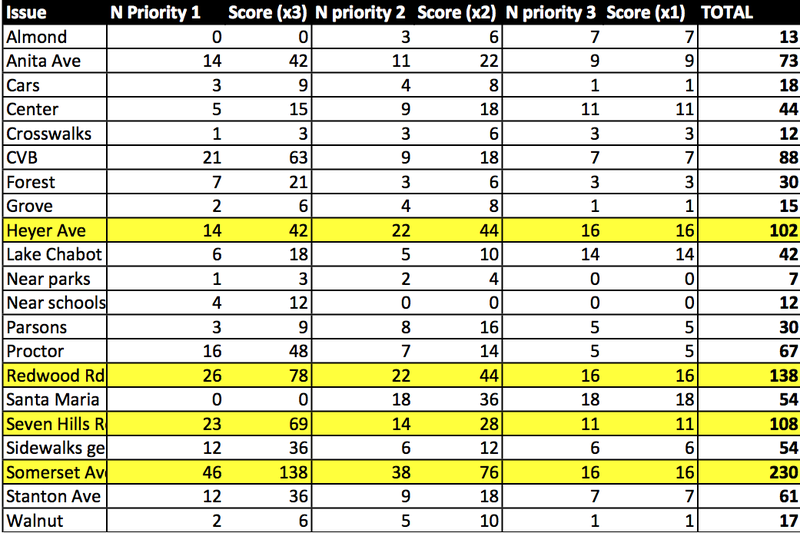 As before, since the survey asked respondents to prioritize the streets named, we assigned three points to top priorities, two points to second priorities, and one point to third priorities. 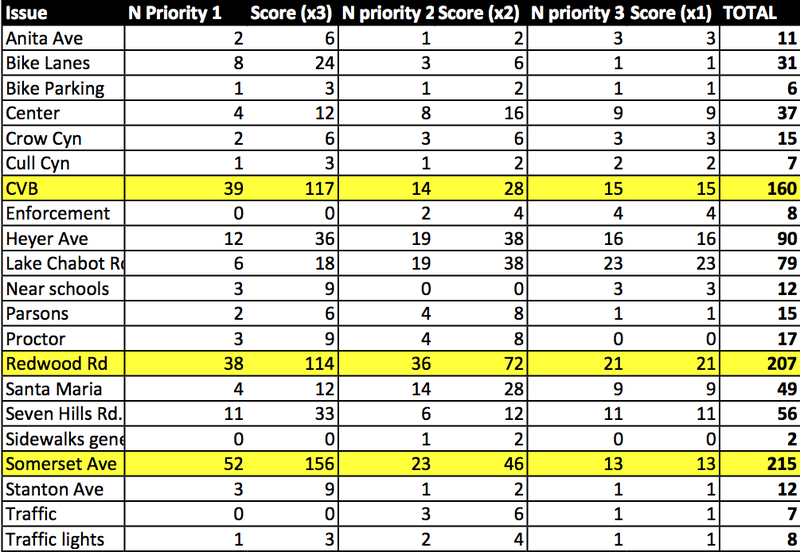 We tried to capture general responses such as “more bike lanes” and “all roads near schools” in our analysis, as well. The top three streets mentioned were Somerset Avenue, Redwood Road, and Castro Valley Boulevard; Heyer Avenue was a distant fourth place. These streets form the backbone of any bicycle network in Castro Valley. The full tally of popular responses is below. Question 7: Please indicate your level of agreement with the following statements, with 1 being little agreement and 5 being strong agreement. 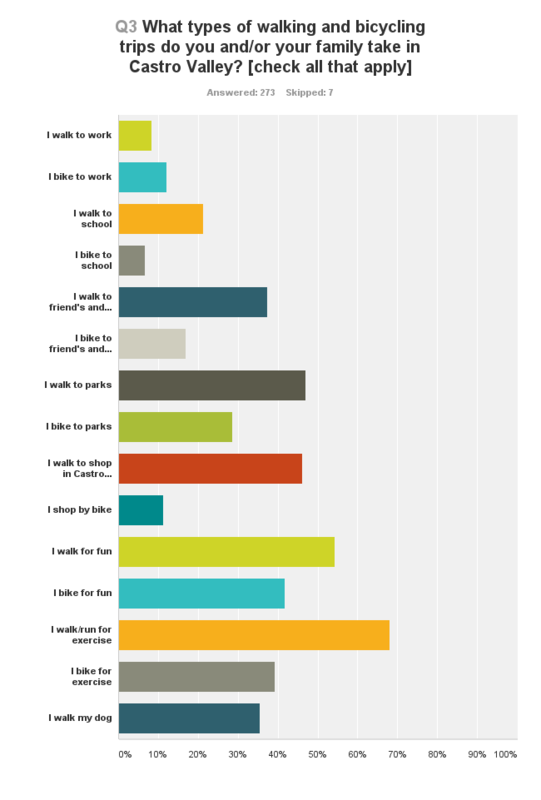 Probably the biggest surprise here is the number of responses from people who would like to use BART, but find themselves thwarted by the lack of bike parking, car parking, bus routes to BART, or low frequency of trains.